One of my students did a presentation on Funny in Farsi. The presentation was so entertaining until I felt that I must read it, and I did. This book has a lot of humor and was quite enlightening in so many ways. 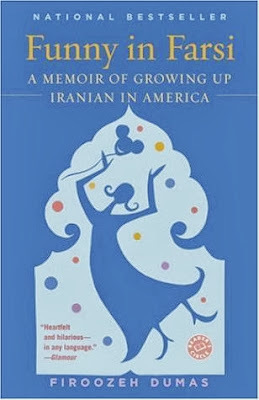 For instance, she explains that "Unlike America, where only the wealthy have live-in servants, in Iran even middle-class families employ full-time help," and that "as a group, Iranians are among the most educated and successful immigrants in this country." If you want to learn about an Iran's family experience of migrating to the United States, then I think that this is a good book to read. Next week I will be discussing Song of Solomon by Toni Morrison with my seniors, so that is my next read. This is only my 1,000,000,000,000 time reading this book, and I am still excited about!!! Read, Read, Read... My People!